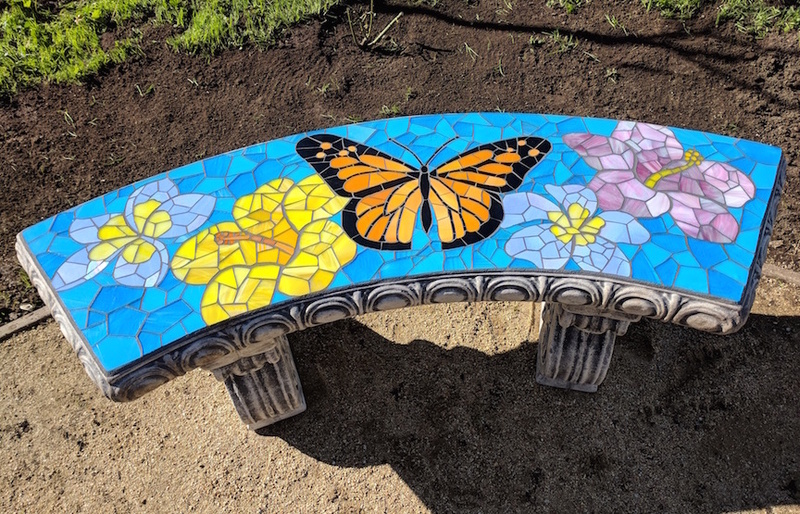 Our most recent mosaic bench was created in honor of a lost loved one for a local family. Love and peaceful thoughts were poured into the design and mosaic work. Piece by piece the project came together through a sense of contemplation as well as joy, beauty and fun. 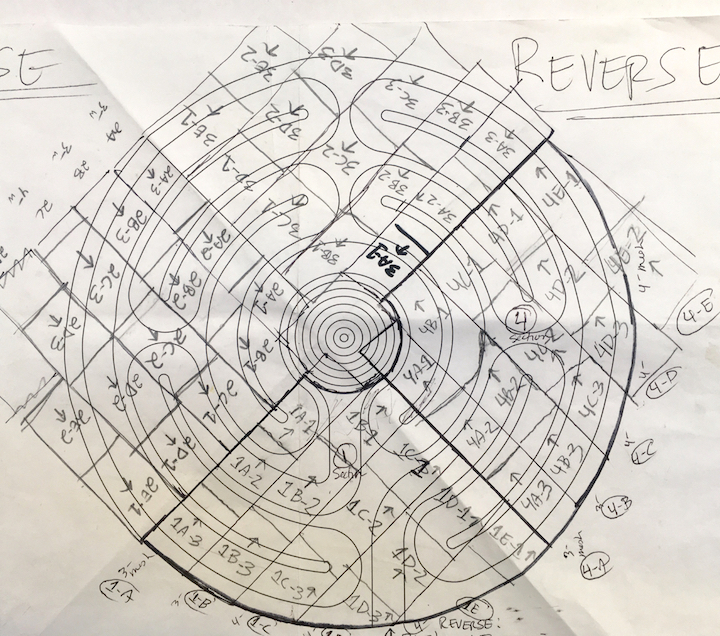 These are not easy projects to make yet very important. We are honored to have been part of this time. 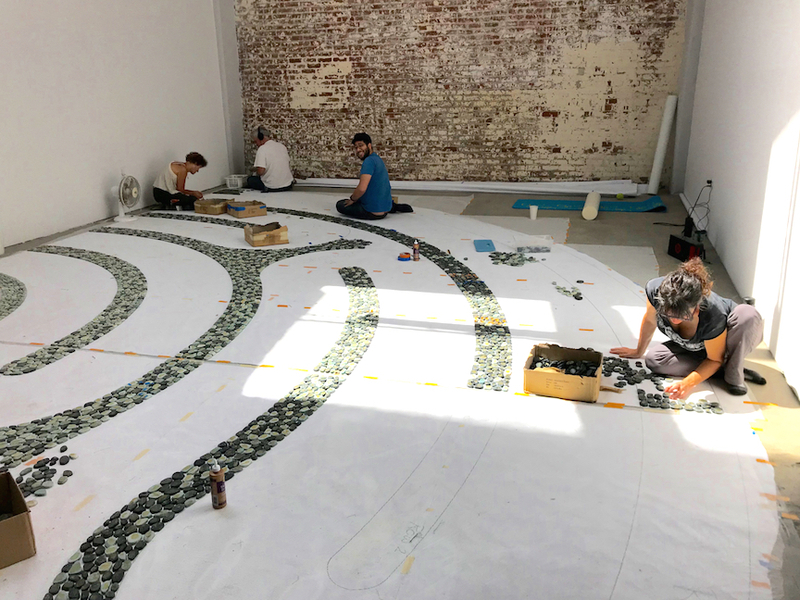 Labyrinth LithoMoasic Installation In Action! 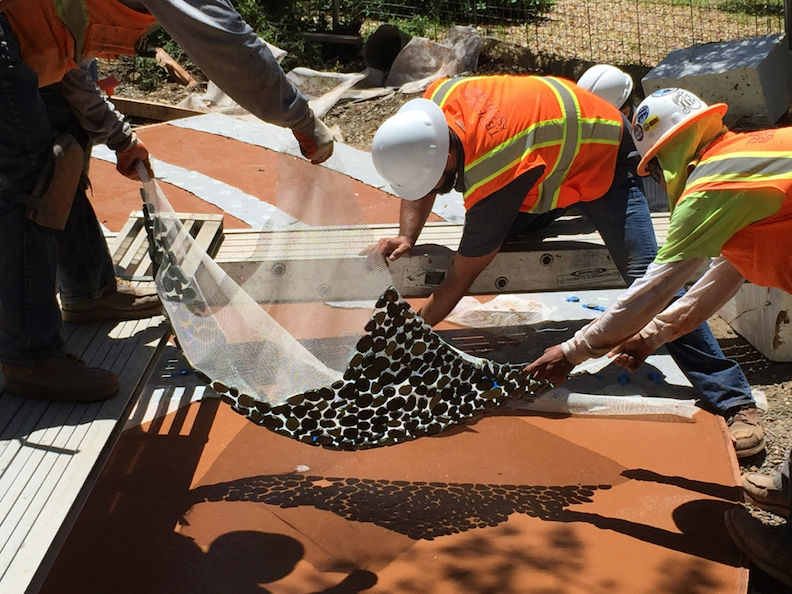 Deciding exactly where to place the entrance and expansion joints... Got it! 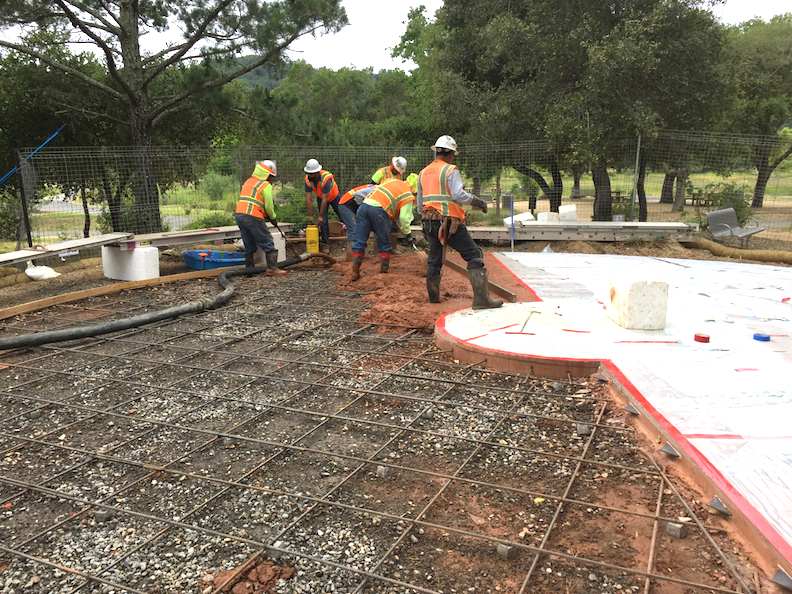 Concrete poured in the first half of the labyrinth! Almost all the mosaics are in! 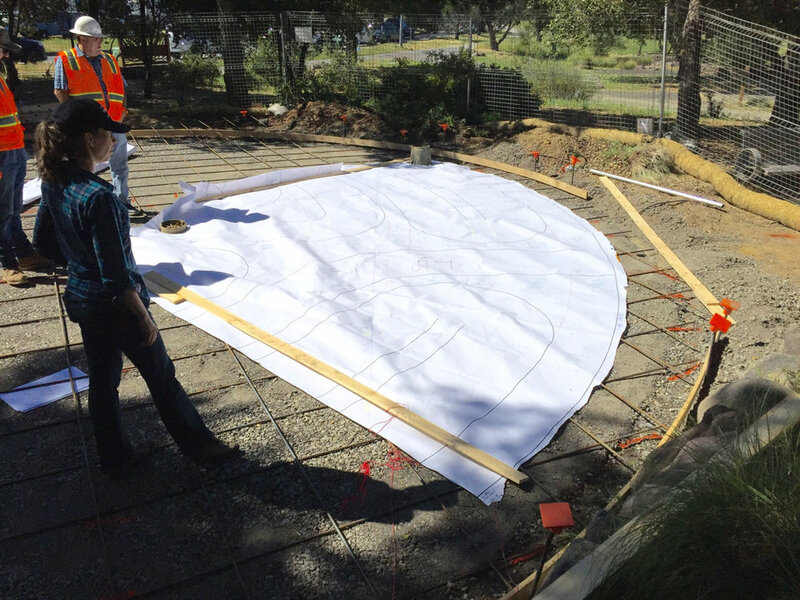 Here are the beginnings of our 36' pebble mosaic labyrinth for Hal Brown Park in Marin. 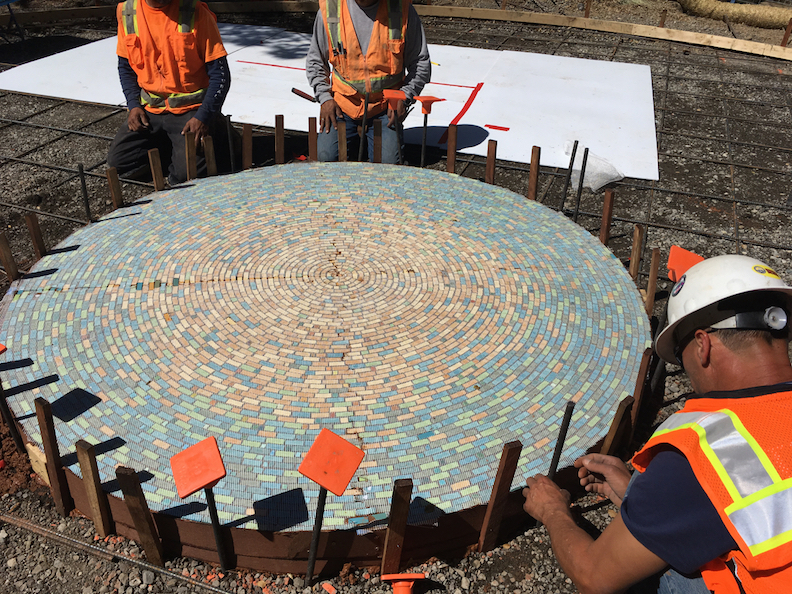 This is our first official LithoMosaic installation, where the mosaic is installed directly into the concrete. Very exciting! The project is so enormous we ended up renting a special studio space from the gorgeous and brand new ArttHaus Studios in Oakland just for the mosaic production. A huge treat. Our materials are all flat cut pebbles for the pathway outlines and color body porcelain for the center circle - almost 400 sq ft in all. Installation pictures coming soon! The template is enormous! And this is only half. Getting close to having this half of the labyrinth complete! All the pebbles are down! Our project LithoMosaic concrete color sample. Definitely going with Terra Cotta. 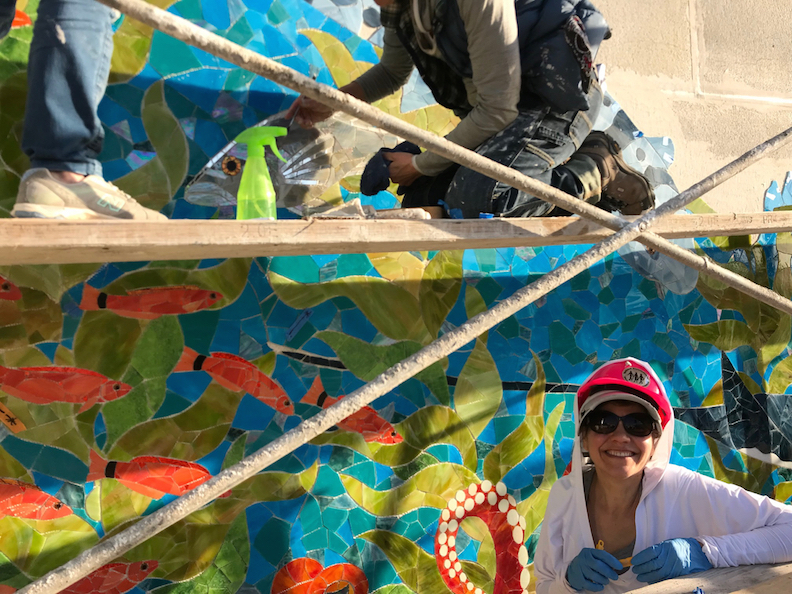 Check out these pics and a quick video of the great Skechers Ocean and Pier Murals reveal celebration that took place last month. 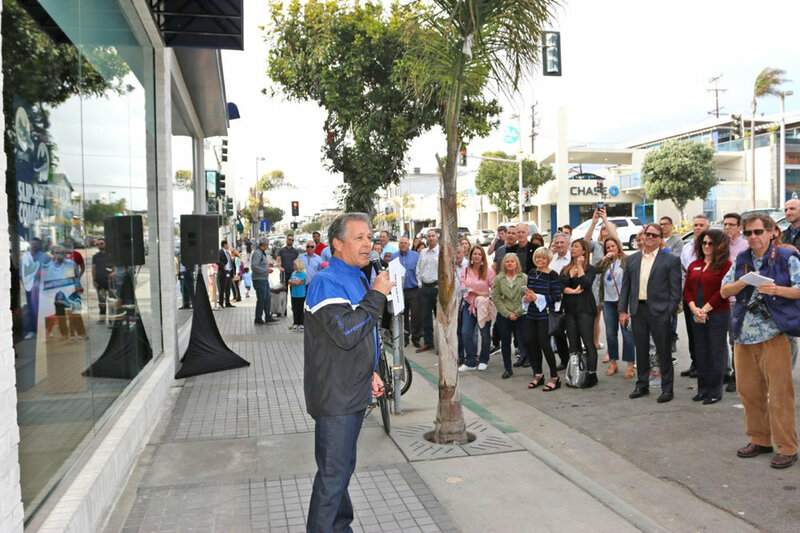 A large group gathered on April 11 to see the curtains drawn and celebrate the Skechers Manhattan Beach flagship store re-opening after months of work remodeling the store and creating the murals. The two mosaics took over 2000 hours to create from design to installation. 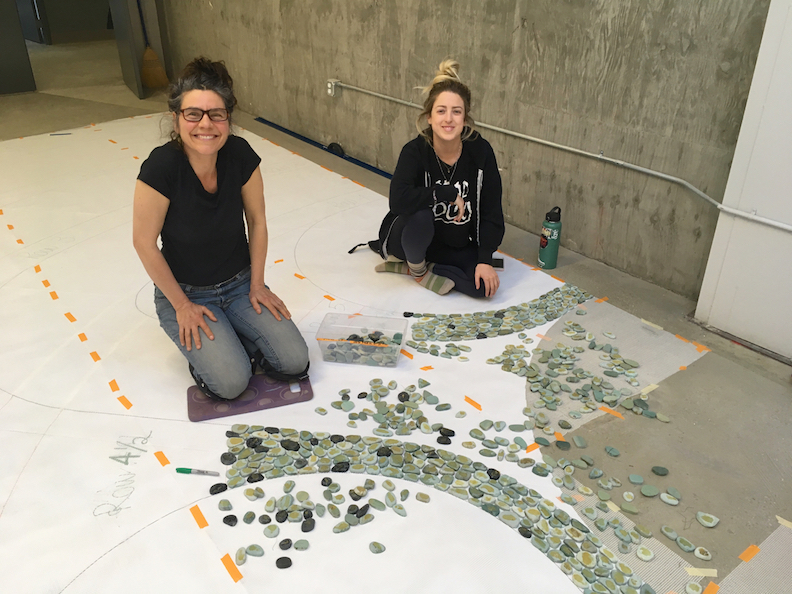 An incredible team of 14 artists assisted Rachel with mosaic production who worked tirelessly to complete the murals. We are very proud to have created these mosaic murals for Skechers! 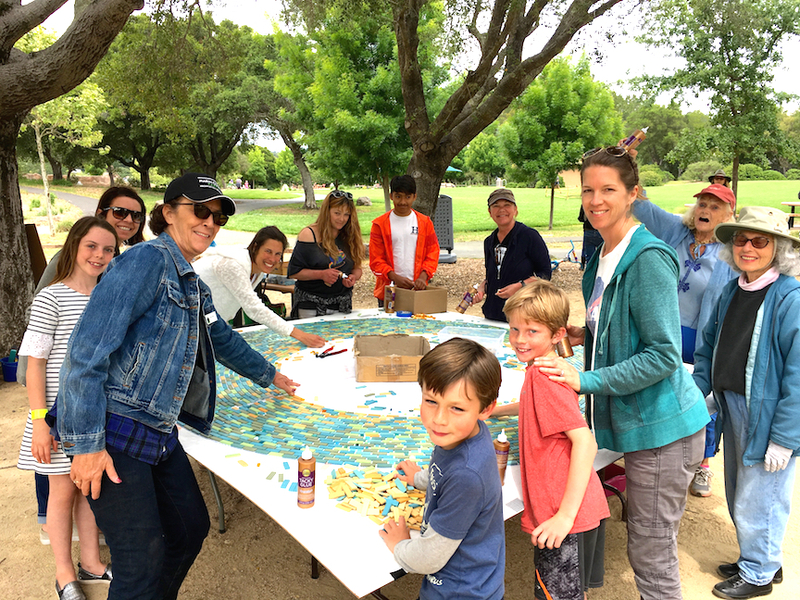 See more images and info on the Ocean Mural and the Pier Mural! QUICK VIDEO OF THE GRAND REVEAL! Custom cookies with our mosaic on them! Ribbon cutting - the store is officially re-open! In the spirit of catching up, wanted to share our installation adventures with the awesome Skechers store mosaic mural from last week. 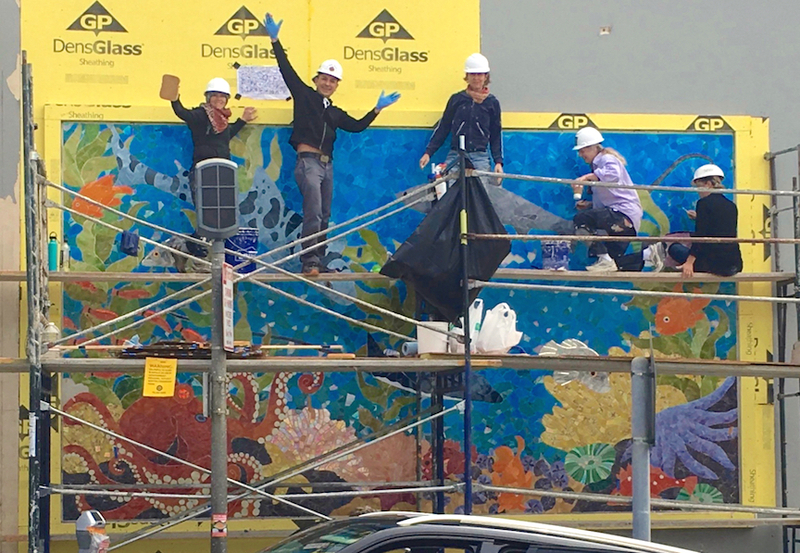 After shipping the 50+ mosaic sections down, the install team flew to Manhattan Beach and put up the mural without a hitch. Lots of love, blood, and sweat went into this mural (no tears). We are proud and excited to have it up. Grand opening and mural reveal pics coming soon! Day 1, Got the first row up! w/ Sophia Othman, Carol Bevilacqua, Denise Hart, Rachel Rodi and Jesse Medina. Jesse removes sections from their cardboard packing. Rachel trowels as the whole team works in high gear getting the sections up. So happy Emily Juiliano got to jump in and help us! Troweling for the last section. Molly with the Last Section! And the very last section fits PERFECTLY! Fantastic!! Celebrate! All the sections are on!